Review After years of complacency – and falling sales – Apple has transformed the iPad into something it should have been from the start: a proper computer. iOS 11, which dropped Tuesday evening, only does a little bit for the iPhone, but a great deal for the iPad. It isn't too much of an exaggeration to say that a mature computer platform has just fallen out of a clear blue sky. We knew this back in June after Apple's developer conference – normally a sleepy affair, but with the biggest news in almost a decade. The iPad was Steve Jobs' final contribution to Apple history, and after his death Apple seemed terrified of changing it. The iPad made two promises: sit-back computing at home, and a new kind of mobile productivity tool. But it didn't really keep either promise. It killed off the netbook category pretty rapidly, but then... nothing. Apple has been phoning it in for the past few years. When it rushed out a smaller iPad in response to a Kindle-induced panic, it used ancient hardware and didn't scale the UI appropriately – leaving tiny tabs in Safari, for example. So the iPad remained essentially a picture frame that ran apps. And perhaps unsurprisingly, people weren't in a rush to upgrade their Apple picture frame on a regular basis... Because it was still a picture frame with apps. I've had just two iPads in more than seven years. They spend their time gathering dust. Given the lack of use, I wouldn't have one at all if the school didn't insist that children do assignments on them. All that excitement about "second screening" that the iPad helped generate passed it by. TVs and phones got better, while the iPad stayed the same. People now "second screen" largely from phones that have got much bigger than the 3.5-inch display models of 2010. In June, at its biggest developer conference in a decade, Apple changed that with iOS 11. It has also given the iPad hardware some long overdue attention. Rather than take iOS 11 through its paces on gleaming new hardware, I wanted to discover how it ran on just about the oldest iPad hardware compatible: the first Air, which is now four years old. The biggest tweaks to iOS 11 are around making it much more computer-like. If you've tried using an iPad for "real work" with a keyboard cover, you'll know its major shortcomings: rotten multitasking, lack of keyboard shortcuts, and lack of a file manager. iOS 11 attempts to cure all three and adds a very ambitious new feature that harks back almost 30 years to a time when Object Oriented Computing was the rage. But more of that in a moment. After dusting down the iPad Air and discovering the battery still held a charge, I set about the installation process. The 1.8GB upgrade took around half an hour, but your mileage may vary. The iOS 11 welcome screen tells you about two new features: a revamped Dock and the swipe-from-the-bottom-and-hold. But such is the complexity of the addition, Apple will need to do a lot more in the way of tutorials. Alas, some gestures don't run on older hardware: you'll need an iPad with 2GB of RAM to see them. But for the first time in eight years there's actually a positive incentive to upgrade. Some new additions in iOS 11 leave my first-gen iPad Air with only 1GB out in the cold, but part of the purpose of this exercise was to see how far I could get. Multitasking has always been comically awful on an iPad, with a minor tweak introduced three years ago to allow apps to run as a side panel. Cue masses of confused users. The Dock is now more like the Dock on macOS – namely, something that's trying to do two different things: launch apps and keep track of running apps. That was a huge criticism of Mac OS X for years, and the criticism only diminished because we realised nothing was going to change. The Dock was previously restricted to five icons, now it takes up to 13 (in landscape mode), with recently used apps tacked to the rightmost three by default. This portion of the Dock can show other things instead, such as suggestions, or you can turn it off and use all the Dock space for your own choices. 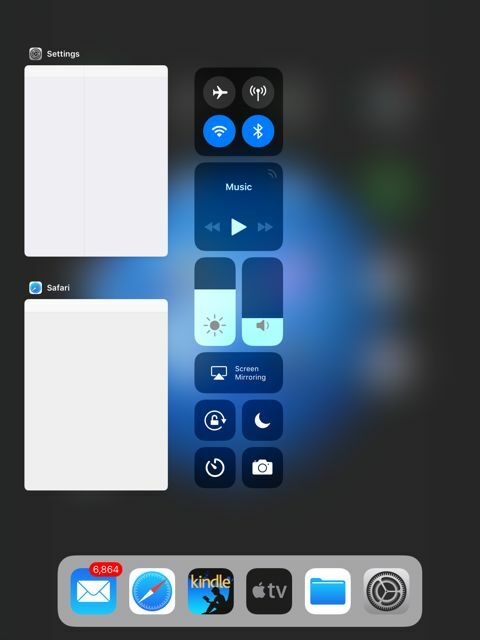 The task switcher now brings up a space not only populated by running apps, but the revamped Control Centre too – a strange choice that leaves it looking messy. The Control Centre is pinned to the right, while running apps scroll off to the left – not something immediately obvious. But having surrendered the gesture used for invoking the Control Centre it now has to go somewhere. I prefer the older method. With multitasking, the intentions are noble but the execution leaves a lot to be desired. The problem comes from two similar but not quite identical things, with very ambiguous names: "Slide Over" and "Split View". The split-screen feature "Split View" is intended to make it easy to use two apps side by side. "Split View" is resizing an app down so another can run alongside it in 50:50 or 75:25 (or 25:75) ratios. But wait, what happened to the old view that was split? That's the Slide Over and, as the name implies, it's an overlay. Only now that sliding window is a floating window. So, you can turn a Slide Over pane into a Split View pane and vice versa. 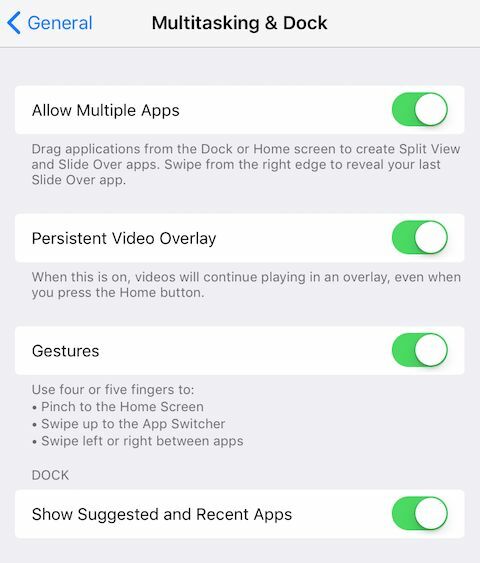 A further gesture allows you to replace apps squeezed into Split View. 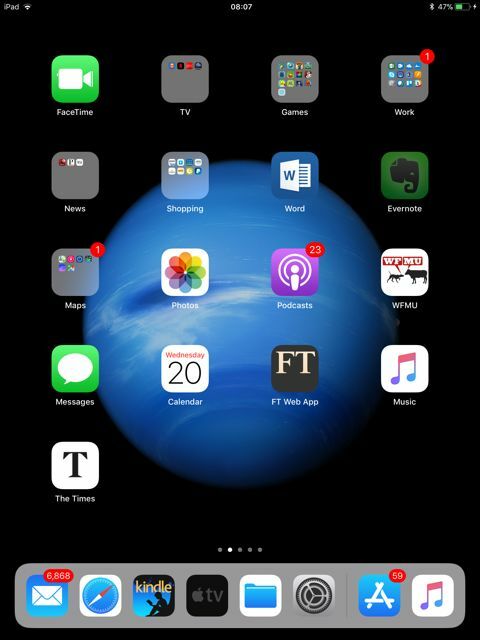 Officially, iOS on the iPad Air, with its meagre hardware rations, only supports a half-hearted Split View, a kind of old-style Slide Over on steroids. If you drag an icon from the Dock it's supposed to open the app, position it on the right, and resize everything else nicely. But it's clunky – most of the time it just makes the icon disappear from your Dock. And you close a Slide Over app by dragging it offscreen to the right. I'm not sure who thought these gestures are intuitive – they probably weren't using an iPad Air – and who thought of using these elusive terms, which apply to both. As one wise observer noted over 20 years ago: "Some people think design means how it looks. But of course, if you dig deeper, it's really how it works. The design of the Mac wasn't what it looked like, although that was part of it. Primarily, it was how it worked." Or doesn't work. I welcome the new flexibility as a big leap forward, but not the implementation. Of course, I'm using a crappy subset of the features available to owners of newer iPads, but much of the vast installed base of iPads is older than two years, and it's going to be coerced into this upgrade. I suspect many will be clamouring for the older method. It would have been kinder to be "cruel" and deprive older hardware like mine altogether. I've no complaints with the Files, the new file manager. After so many years where apps had to implement a pseudo file system in a database, it's long overdue. Files automatically finds apps (such as Dropbox or your NAS server app) which use their own cloud or local file system. It doesn't turn them all on by default – you'll have to do that yourself. "Send to File" now appears as a destination in other apps. Now you may be wondering what's the big deal here. It isn't really the task juggling, although that's nice when it works. It's drag and drop. Given sufficiently modern iPad hardware, drag and drop in iOS 11 is really what turns it into a modern computer. Remember IBM's paperless Workplace office? And all those demos of Bento and OLE from the early 90s? If you don't, it's hard to relate how "the end of apps" was such a big deal at the time. Of course it came to nothing. Big apps companies didn't like the idea of chopping themselves up into soup ingredients and selling features individually. Commercial business apps had huge ecosystems of add-ons (particularly Lotus 1-2-3) and didn't fancy the expense and chaos of this wonderful new object-oriented world. The world woke up one day and realised Microsoft was not the only game in town, that "objects" were really crappy, and it would all get absolutely nowhere. And the internet had happened: it was a new Gold Rush for software developers. You didn't need to wrap your head around this. Well, iOS 11 is a bit like those old OLE or CORBA or Bento demos, but it works. You can drag and drop files, pictures, and URLs and the receiving application deals with the relevant data type. It works for multiple items. I said "sort of", since it doesn't try to do anything clever with the data, like set up a fancy IPC pipe between the sender and the receiver. (Microsoft sold OLE almost entirely on the lure of live stock price updates piping into Excel, or from Excel from Word). But conceptually and practically it's a big leap forward. I expect to see more of this. I hesitate to draw conclusions on performance after a few hours. Background processes are reindexing content, and you expect a few bumps before things settle down. But, er... 12 seconds to open the Kindle app?